The snow is melting, the days are getting longer and spring is almost here. That means you’ll soon be spending more time outdoors with your dog. This is a good time to plan on how to deal with ticks this year, especially if you love hiking with your pup. Has this ever happened to you? You return home from a long hike with your dog and sit down to relax with a cool drink. As your faithful trail companion rests beside you, you reach down to reward him with a calm belly rub or massage. You’ve got that “Life is Good” feeling going on, until you feel a little bump on your dog’s skin. You separate his fur to investigate and discover a blood sucking tick has embedded itself into your sweet dog. Yuk! Any kind of parasitic feeder gives me the creeps, but I especially hate ticks! These eight-legged parasitic arachnids come in a variety of types and sizes and some carry diseases such as Lyme disease, Rocky Mountain Spotted Fever and Ehrlichiosis. Where I live, the American dog tick is the most common and they are more active in the spring and early summer, but if you live in a warm, humid climate, ticks can be a problem all year long. Visit the Dogs and Ticks website to find out what ticks and tick related diseases are common in your area. Ticks climb up on blades of grass, twigs or shrubs where they hang out, waiting for you and your dog to come hiking down the trail. You’re likely to find more ticks in moist, shady areas like where a grassy field meets a section of woods, but deer and human trails are also a common place to find ticks. When your dog gets close to or brushes up against tick infected vegetation, a tick can drop off and hitch a ride. It then begins seeking out a warm, dark feeding site before attaching its jaws and inserting a blood sucking feeding tube. Disgusting, right? Since ticks are usually found in hiking areas, here are some ways to protect yourself and your dog from these freeloaders. Discuss tick prevention treatments with your vet. Oral and spot-on remedies are effective but some dogs have had adverse reactions to these types of preventative treatments. I really hate putting toxic chemicals in or on my dog, so I opt for the minimum amount of treatment that will protect her. For Haley, that means giving her a monthly spot-on flea and tick treatment only for the two or three months of the year when ticks are most active in our area combined with routine physical inspections for ticks. Talk with your vet about whether these medications are right for your dog. Consider a natural tick preventative. Talk with a holistic vet about natural treatment options. Some dog owners claim to have success by feeding their dogs garlic or apple cider vinegar, but garlic can be toxic to dogs, so get a professional opinion before starting any natural treatment plan. Evaluate tick shampoos, dips, powders and collars with caution. Personally, I’ve never been a fan of these products. Some may be effective, but many are not. Some can also be toxic for humans, puppies, pregnant or nursing dogs, cats and fish. Talk with your vet before using any of these to see if there’s a better alternative. If you decide to use these types of products, read and follow the directions carefully. Wearing light colored clothing can help detect areas that are infested with ticks. By tucking your pant legs inside your socks and tucking your shirt inside your pants, you’ll have a better chance of seeing any dark colored ticks that attempt to crawl up your legs. You can easily flick them off before they get to your skin. Yeah, you might look a little weird, but you probably won’t run into the fashion police while out hiking the trails. 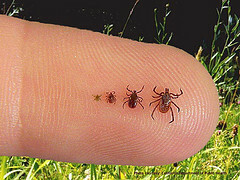 Stop occasionally and check for any crawling ticks, especially when entering a new area of your hike. If you suddenly notice a lot of the little crawlers, change your route if possible. Permethrin spray is an effective tick repellent that can be used on clothing, but it can be toxic (especially to cats and fish) and should be used with caution. A better alternative might be to buy commercially treated pants if you do a lot of hiking. Avoid off-leash hiking in areas where ticks thrive. 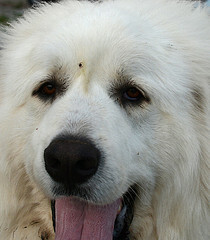 Dogs love to sniff and investigate along the edges of trails where ticks are waiting on blades of grass or brush. You can avoid picking up ticks by keeping your dog on a leash and by walking in the middle of the trail, especially during the height of tick season. Inspect your dog after the hike. Check your dog for ticks before getting in your car. I keep a fine toothed comb in our vehicle to remove any ticks that are still crawling around on Haley searching for a feeding spot. I also feel for any ticks that can be easily removed before heading home. Nobody wants to discover a tick crawling inside their vehicle a few days after hiking with their dog. Inspect your dog when you get home. Do a more thorough tick inspection of your dog when you get home, even if you use an oral or spot-on preventative treatment. Do a visual inspection and use your fingers to feel for bumps that may be attached ticks. Ticks can be found anywhere on your dog, but popular hiding areas are on the head, neck, legs, armpits, belly, chest, tail, between the toes, and in and around the ears. Since it can take several hours before an attached tick can transmit a disease to your dog, you can eliminate most of the risk by performing a thorough inspection and removing any ticks soon after arriving home from your hike. Inspect yourself when you get home. If you’ve been hiking in a tick infested area, first remove your clothes and put them in the dryer for 15 minutes on high heat, then head for the shower to thoroughly inspect yourself for any ticks. I also like to leave my shoes outside for awhile in case there are any ticks hiding in them. After my shower, I remove my clothes from the dryer, then wash and dry them normally. It’s not a guarantee, but it most likely will take care of any ticks that were on my clothes. 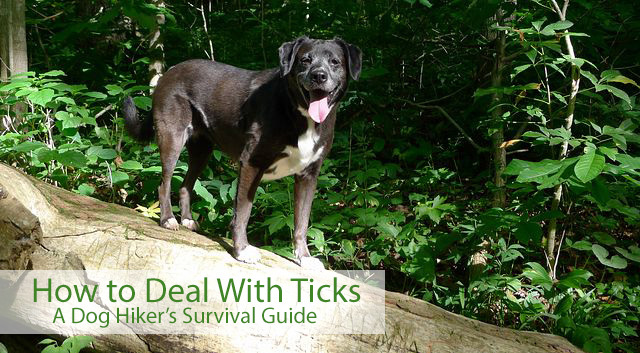 It’s almost inevitable that one day your dog will have a tick, even if you’re not a hiker. I’ve tried several methods of removing them, including covering the tick with petroleum jelly, dish soap or alcohol in hopes that the tick will back itself out, but I’ve never had luck with any of those methods. I have had great success with the method below. Once you discover a tick, don’t panic. It’s easy to remove and you’ll want to keep your dog relaxed during the procedure. Here’s what you’ll need: Fine-tipped tweezers (precision tweezers) and a small jar or plastic bag to put the tick in once it’s been removed. Latex gloves and a magnifying glass are also helpful if you have them on hand. Special tick removal tools are useful if your dog gets a lot of ticks, but they may not be effective for removing small ticks. Separate the fur around the tick, then use the tweezers to grab the tick close to where it’s attached to your dog’s skin. Don’t grab or squeeze its body which could separate from the head or inject the contents of the tick into your dog’s skin. Gently and slowly pull the tick straight upwards. You may notice your dog’s skin pulling up just a little bit when you do this. Gently hold pressure on the tick while being careful not to twist or crush it. The goal is to remove the entire tick, so be patient as you hold pressure. After a few moments, it should release its grip. 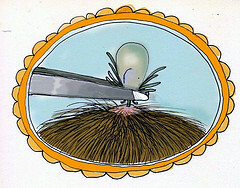 If the tick’s body comes off and the head or jaws are still attached, try to carefully remove the pieces left behind. If you’re uncomfortable doing that, check with your vet to see if a visit is required. Place and seal the tick inside the jar or plastic bag along with a small amount of rubbing alcohol to kill the tick. You may want to date and retain the container for analysis in the event your dog develops any symptoms of illness. Apply chlorhexidine, Betadine or an antibiotic ointment to the area where the tick was attached. Wash your hands and the tweezers thoroughly and give your pup a treat for being so cooperative. Keep an eye on the site for a week or two. Some mild irritation or swelling is normal, but contact your vet if you notice anything unusual or signs of infection. Whether you enjoy hiking with your dog or not, being proactive and watchful for ticks can help prevent your dog from getting a serious tick-related disease. Ticks can be found almost everywhere, so check your pup often, especially if you notice any excessive scratching, head shaking or chewing/biting of fur. Make sure to discuss any questions or concerns about ticks with your vet and be watchful of any behavioral or health changes after you’ve removed a tick from your dog. Hiking with your dog is a lot less stressful when you have a plan on how to deal with ticks. Before you head off on your next adventure, share your tick tips with us. Happy Trails! Update! Rachele Baker, DVM and Jodi from Heart Like a Dog both offered their favorite way of removing a tick. It’s called tick spinning which causes the tick to release itself intact from your dog’s skin. I’m going to try this method the next time Haley gets a tick. Here’s a video of how to spin a tick if you want to see it in action, but you might want to grab a pair of latex gloves first. Thanks for the great tip, Rachele and Jodi! Nice post, Elaine! As a veterinarian, I have had pet parents tell me many different ways they have used to try to remove ticks. Some methods people have used are quite dangerous – such as trying to burn off a tick with a match or lighter. I have seen a dog seriously burned with this method – definitely not recommended. Years ago a veterinary technician shared her method of removing ticks with me and it is the best, most effective method I have ever used. So now it is the ONLY method I use. It works to completely remove the entire tick every time without any fear of the tick’s head or other body parts remaining embedded in your pet’s skin. First, put on rubber gloves since tick-borne diseases can be transmitted to humans as well as pets. Then put your gloved index finger on the body of the tick and start gently, but firmly, twirling the tick’s body in a circular motion. After a couple of minutes of this, the tick releases its hold and starts trying to move on to another site. Then it is easy to remove the entire tick and drop it into some alcohol to kill it. A word of caution: this method does not work if you have removed part, but not all, of the tick and the tick is no longer alive. Thanks Rachele, I’ve never heard of this method before, but it sounds like it works really well. We do a lot of hiking, so the next time Haley gets a tick, I’m going to give this a try. Luckily, I’ve always managed to remove the entire tick, but I do worry about their heads breaking off when using tweezers. Thanks for sharing this great tip! I still get freaked out when I find one on Haley, yuk! I’m glad you don’t have to deal with too many of them where you live. It’s probably harder to find them on Huskies with their thick coats. Great post – it is that time of year. I’ve started to check Jack & Maggie when we come back because we always walk in areas where ticks LOVE to breed. Yep, it’s that time of year. I’m hoping it won’t be a bad year for ticks and fleas. Really nice reminder about ticks, thanks! When we lived in IL we had to deal with ticks. They’d get so hugely bloated if left unattended on dogs, so gross, stuff of nightmares!! Thanks Leah! I’m glad they’re not a huge problem where you live now. I’ve never had to remove a really bloated or engorged tick yet, but that would be disgusting! Ugh, this is the one thing I hate about spring. They are so disgusting! We have found tweezers to be the best method of removal and so far have had success with it. I used to yell for my hubby if I found a tick on the dogs, but now I am home more than he is so have had to learn to do it myself! I’m not thrilled with the spot on chemicals, especially since we have still had to remove ticks after using those. We try to stay to open trails when we walk or hike….but I swear, the dogs always want to go into the brush! It is hard to stay in the middle of the trail, watching each and every blade of grass, especially when dogs want to sniff around along the edges. I guess the spot-on chemicals would kill the ticks in a day or two, but I hate taking any chances and check for them every time too. Here’s to hoping the ticks won’t be too bad this year! What an informative post! Ticks have always grossed us out. When I worked at the vet it always made me squirm when we pulled one out of a dog! Eck! Ew, ticks! The dog I grew up with used to get them all the time. Thankfully, Choppy has been relatively tick-free over the years, which I am thankful for. I hate those little bugs! You’re so lucky Sarah! We seem to have a lot of them around here, especially in the spring. Great post. I hate the chemicals too. We have our yard sprayed and when tick season is in full swing, the dogs get sprayed with a natural flea and tick repellant every day. It adds a little time to my routine, but I prefer it over the chemicals. Dr. Baker beat me to the easy tick removal trick. It is called tick spinning and if you google it, you’ll find a video. I’m so happy you and Rachele mentioned this method. Here’s the video link to see how it works (although, I would grab a pair of latex gloves first, like Rachele suggested). https://www.youtube.com/watch?v=oQHZUv1Rtgs I’m anxious to try this myself…Ok, maybe I’m not that anxious, but I’m definitely going to give this method a shot next time. Thanks, Jodi! I love this post ~ it’s spot on! While I am not a huge fan of chemical preventative treatments, I don’t really trust the natural methods such as collars and sprays…so I do use the monthly topical applications (I’m open to natural suggestions, however, IF they really work!). Thanks Barbara, I would love to find some natural methods or products that work well, but most of them seem to be only somewhat effective. But, I’m always open to giving new natural products a try. Good reminder! I have a tick remover gadget that works for humans but I haven’t tried it on a dog. It really freaks me out when I have a tick on me after hiking. I’m going to have to look for one of those gadgets, Linja! You’ll have to let me know if you try the spinning method. I’m hoping this won’t be a bad year for ticks and neither of us will have to deal with removing one.